Learn how to make hot cross bun recipes which are the most famous of Easter breads served throughout the Christian countries. In countries like England it is the tradition to bake these delicious rolls on Good Friday morning and eaten for breakfast. Of course enough are usually baked to last through the Easter weekend. These special rolls or buns (whatever you want to call them) are round in shape and have a cross indented on the top of each signifying the cross of Christ. French toast and quiche Lorraine are other popular breakfasts for Easter weekend but especially Easter morning. Cooks learn how to make the hot cross bun recipe which was introduced to England by the Romans back in pre Christian times. The tradition of the rolls is said to have begun when one of the monks at St. Alban’s Abbey baked them as gifts to the poor. It is hard to believe these delicious sweet tasting, slightly spiced buns could have led such a controversial life since their origination. 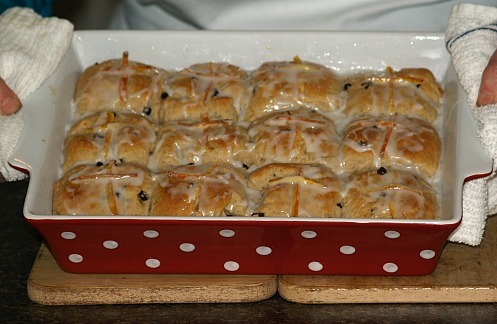 The hot cross bun recipe, often made with raisins, currants or other fruit, have often been found offensive; so much so that at times they were banned from being served. As people learn how to make the hot cross bun recipe, they found all kinds of beliefs (or superstitions) pertaining to this bread. These Good Friday rolls as the story goes, unlike regular bread, will never grow moldy if kept for a long time. (I think they say this because if you have ever eaten these buns you know how good they are. They never last long enough to get moldy.) Stale buns have a history of being used for medicinal purposes as they were grated into medicines. Stale ones also were used as charms against shipwrecks, for keeping rats out of the corn, and were hung from the ceiling as a good luck charms for the family. Combine and mix into a batter 1 cup flour, 1 teaspoon sugar, yeast, water and milk. Cover mixture and set aside for 20 minutes. Combine in another bowl remaining flour, salt, ¼ cup sugar and spices. Add yeast mixture, butter egg, currants and peel to the flour mixture. Mix to a soft dough; add additional flour if mixture is too sticky; knead until smooth. Shape dough into a ball and place in a greased bowl. Divide dough in twelve parts; shape in buns and place in greased 9 x 12 pan. Cover and let rise 30 minutes; PREHEAT OVEN TO 375F degrees. Use pieces of candy peel to make a cross on each bun; bake 15 to 20 minutes. Cool buns on rack; brush with a powdered sugar glaze. NOTE: When I made the chopped candied orange peel, I also made 24 candied orange peel strips to shape the crosses. Combine scalded milk, butter, sugar and salt: Cool to lukewarm. Soften yeast in warm water; stir and combine with cooled milk mixture; add about half of flour, cinnamon and beaten egg; mix well. Add enough of remaining flour to make soft dough; mix thoroughly. Turn dough out on a lightly floured board and knead about 10 minutes, or until smooth and satiny. Place dough in a warm greased bowl; brush surface lightly with melted butter. Cover and let rise in a warm place about 2 hours or until double in bulk. Turn out on and lightly knead in raisins or fruit. Shape into balls about 1 ½ to 1 #/4 inches in diameter; Place in a greased 8x8 inch square pan. Brush with egg yolk diluted with a little water. When cool make a cross of powdered sugar icing on each bun. This recipe is made with a basic sweet dough recipe which can be used to make many different types of bread. Heat milk in a small saucepan just until bubbles form around edges; remove from heat. Add sugar, salt and butter stirring until butter melts; cool to lukewarm. Sprinkle yeast over warm water in a large bowl stirring until dissolved; stir mixture into milk mixture. Add egg, 1 ½ cups flour and cinnamon and nutmeg (from hot cross buns); beat to blend. Beat with spoon until smooth and dough leaves sides of bowl. Turn dough out onto lightly floured surface; knead until dough is satiny and elastic and blisters appear. Place in a large greased bowl and turn to grease top side; cover and let rise in warm place until double. Turn dough out on lightly floured surface and with hands shape dough into roll 12 inches long. Cut roll crosswise into nine pieces; shape each piece into a ball and tuck edges under to make smooth surface. Arrange balls in a greased 9 X 9 inch baking pan; with palm of hand flatten each ball to 2 inch round. Cover and let rise in warm place until double in bulk; with sharp knife cut cross on each roll. Bake at 375F degrees about 20 to 25 minutes or until golden brown. Drizzle powdered sugar glaze over hot buns. 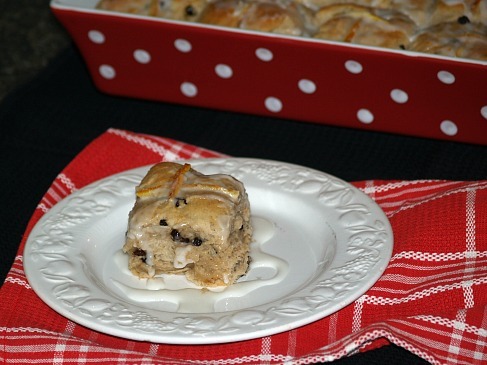 A hot cross bun recipe can even be baked over campfires or on your grill in a Dutch oven. Combine and mix brown sugar, butter and salt in a bowl; add 3 cups flour and yeast mixture. Mix in currants and nuts; continue adding and mixing the remaining flour a little at a time until soft dough forms. Add cinnamon and knead well; place dough in a lightly oiled bowl and let rise until double in bulk. Dutch oven; let rise until double in size. Bake at 400F degrees for 30 to 35 minutes (8-10 hot coals on bottom and 18 to 20 hot coals on top). When done remove from oven; mix powdered sugar with enough milk to make glaze and drizzle over rolls.